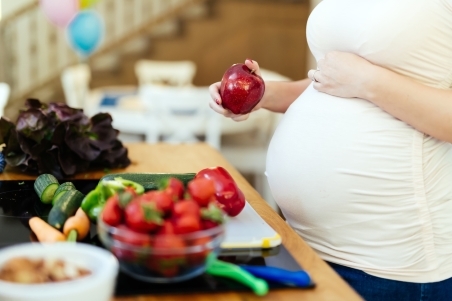 Eating a wide variety of foods in pregnancy will help you to get the most of the vitamins and minerals you and your babies' need. But there are some supplements such as folic acid and iodine you should take to give your babies the best chance of being healthy. Doctors and midwives recommend that you take folic acid for at least a month before becoming pregnant and until you're 12 weeks pregnant. This reduces the risk of your babies' having brain and spinal problems. If you find out that you're pregnant and you haven't been taking folic acid, start taking it as soon as possible. Keep taking it until you're 12 weeks pregnant. Doctors and midwives also recommend that you take an iodine supplement containing 150 mcg (micrograms) while you're pregnant and breastfeeding, as your needs increase during this time. Your babies' also need iodine to grow and develop normally. Essential fatty acids help form your babies’ nervous system and other tissues. regularly choose eggs as a convenient cheap meal or snack. eat plenty of vegetables every day, particularly dark green types, such as spinach, broccoli, green peas and green beans. spreads such as Marmite, Vegemite, peanut butter. Although liver is a rich source of iron, you should only eat small amounts (no more than 100 grams each week). This is because liver contains very large amounts of vitamin A, which can harm growing babies. Vitamin C helps us to absorb up to four times as much iron from our food. You can get vitamin C from many fruits (berries, feijoas, kiwifruit, mandarin, orange, rock melon, tamarillo) and vegetables (broccoli, capsicum, cauliflower, tomato). Try to include fruit or vegetables with every meal, especially if you're vegetarian. Tea, coffee and milk drinks can decrease iron absorption so only drink these between your main meals. For more tips to improve your iron intake especially if you're vegetarian see How to get your daily iron. If you're not able to get enough iron from your diet you may need to take an iron supplement. Your LMC or GP will advise what is most appropriate for you. Calcium is important for the formation of your babies’ bones, particularly in the last months of pregnancy when babies are growing rapidly. You need 1000 mg of calcium per day. you can get this by eating a varied diet and including at least 3 servings of milk and milk products each day. A serving is 250 ml of milk, 1 pottle of yoghurt (150 g), or 2 slices of cheese (40 g). If you can't get enough calcium from your diet, you may need to take a calcium supplement. Talk to your LMC or GP for advice. The best calcium tablets are those that contain around 600 mg of calcium per tablet, such as Caltrate. Vitamin D helps your body to absorb calcium and maintain strong bones. Food sources of vitamin D include eggs, oily fish, and vitamin D enriched foods such as some types of milk, yoghurt, and margarine. It's very difficult to get enough vitamin D from food alone and the best source of vitamin D is sunshine directly on your skin (not through glass or with sunscreen on). Twenty minutes a day is recommended, but in summer limit this to before 10 am and after 4 pm to avoid sunburn. Zinc is essential for your babies’ growth. The best sources of zinc are lean red meat, chicken, wholegrain breads and cereals, legumes, nuts, seeds, and dairy products. If you're eating well and choosing daily from the four food groups you shouldn’t need to take a multi-vitamin supplement. But you may need one if you've had severe morning sickness and have been vomiting often. If you take a multi-vitamin supplement choose one that is designed especially for pregnant women. Regular multi-vitamin supplements may contain too much vitamin A and this can harm your babies. Thiamine helps your body turn food into energy. Food sources include wholegrains, meat and fish. If you were vomiting a lot in early pregnancy you may have been prescribed thiamine. Continue to take this until you're eating normally again and the vomiting has stopped. B12 is found only in animal foods or specially fortified foods, such as Marmite, So Good soy milk, Special K breakfast cereal. If you eat little or no animal foods, talk to your LMC or GP as you'll need to have a blood test to check your B12 levels. If your level is low, you'll need a vitamin B12 supplement or vitamin B12 injection.